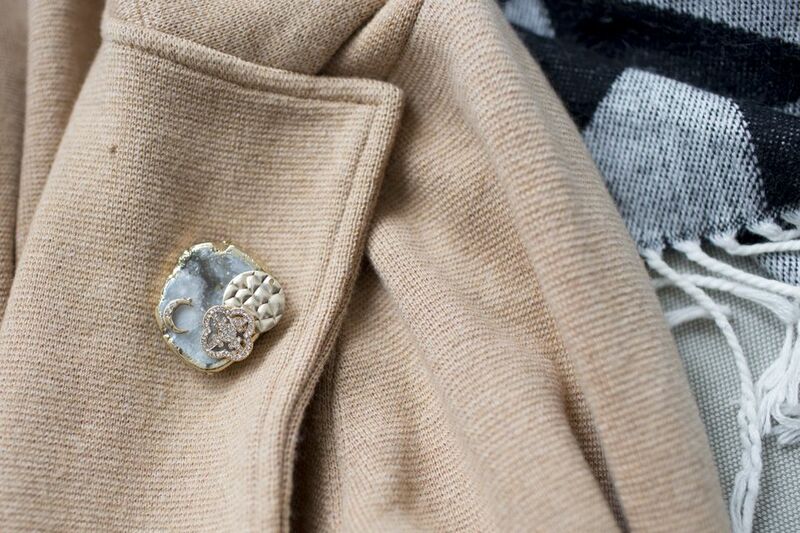 Brooches are making a major comeback! Instead of buying, why not DIY your own version? Not only is it more meaningful, but you can choose exactly what accessories make their way onto your design. We bet you didn't know how easy it is to design your own. The most important component of the brooch is going to be the charms and baubles you choose to layer. Keeping metals and colors somewhat consistent will lead you to a more cohesive finished product. Also, choosing charms with meaning adds an extra layer of fun, too. Once you've chosen your charms, you're going to want to clip off any extra metal loops or clasps that are no longer needed. Use a metal or wire cutter to work them off. It should only take a little persistence and hand strength to get the job done. If you can't get certain things to come off, don't sweat it. Just try to layer or work around it. Before you even think of picking up the glue—seriously, don't even look at it—you need to figure out what needs to go where. Obviously, the largest, flattest piece will act as your base. In the middle layer you'll want to place the less detailed and flatter pieces, things that will add a little color or texture but aren't the start of the piece. The final top layer will be your smallest most detailed charms. You're going to want to play with placement and move things around before figuring out your final design. Once you've found the perfect arrangement, snap a picture with your phone so you don't forget where you want everything. You can use different types of glue to do this, but we prefer the E6000 craft adhesive. It's clear, it's thick enough that it immediately holds things in place, and it's strong once it dries. Because the charms are so small, you're not going to want to apply the glue straight from the tube directly to the backing. Use a bamboo skewer to gather a little bit of glue and put it on the back of the charms. Start gluing your bottom layer and work your way up. Then let the charms dry completely to the backing before starting the next step. Pin backs are easier to find at your local craft store, so you don't need to worry about making one. You'll want to use the same craft adhesive as you did with the charms and the skewer to make sure the pin back sticks completely to the back of the brooch. Again, you're going to need to be patient and let the craft glue dry completely before pinning it to your favorite jacket or bag. Just let it sit overnight before you wear it. This project is the perfect way to reuse old jewelry with sentimental value or create a beautiful, handmade gift for a loved one or friend.